The exhibition space of Framer Framed is located at the Tolhuistuin in Amsterdam, the Netherlands. It aims to be a free space for arts & culture. The Tolhuistuin consists of eight buildings in a parc. The main 4.500 m2 pavilion offers a music hall, restaurant, an exhibition space, conference facilities and two dance studio’s. Four smaller buildings offer workspaces for young professionals in music, visual arts, architecture, design and literature. Rooted in the communities of Amsterdam North, the Tolhuistuin host a widely varied program of music, theatre, dance, visual arts, media and literature. Framer Framed aim’s to serve an audience from Amsterdam and beyond, following the agenda of a new Europe, hospitable and cosmopolitan; the new Europe as we would like to see it. Framer Framed in the Tolhuistuin can be reached from Amsterdam Centraal Station with the ferry ‘Buiksloterweg’. 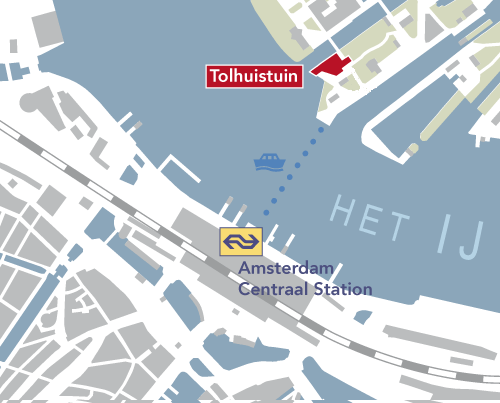 The entrance is located directly at the IJ riverside. The exhibition space is located on the first floor adjacent THT restaurant. Admission to the Framer Framed exhibitions and public program is free.